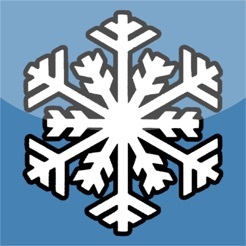 Get the prediction power of the Snow Day Calculator in an App. 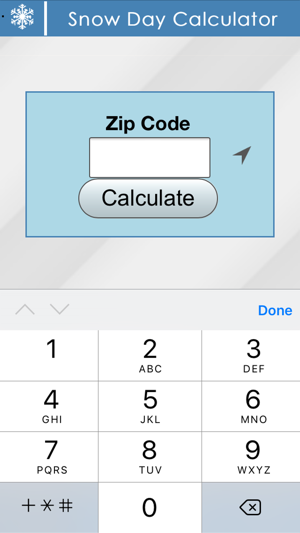 Using just your zip code, David Sukhin's famous Snow Day Calculator will predict the chance of a snow day. The Snow Day Calculator automatically pulls weather information from the National Weather Service and uses a carefully developed formula to give super accurate snow day predictions for your school! Predictions always use the most recent weather information and new predictions become available at noon each day. 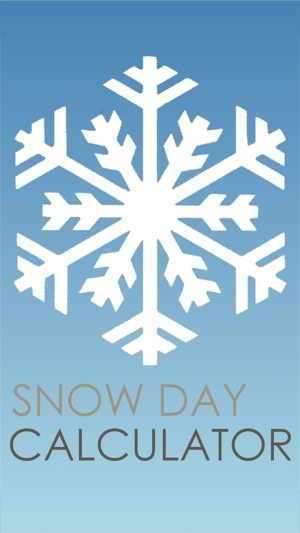 You can also sign up for Snow Day Notifications for up to three days in advance and join your school group for even more accurate predictions! What's your chance for a snow day tomorrow? Some optional features of the app may occasionally use location services which may affect your battery life. You have the option to enable and disable these features at any time. 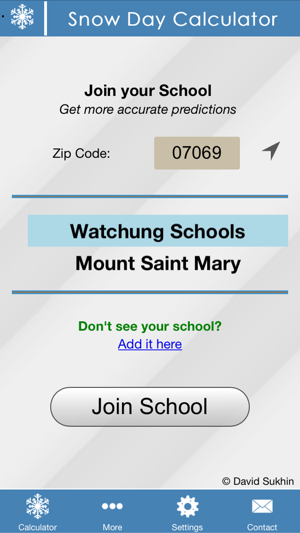 New Snow Day Calculator App! When I first got this app, I used it for fun, not really paying attention to the chance we got for a snow day. I then tried to use it to see if school would end up getting canceled, because then our basketball ball games would get cancelled. I’ve tried it multiple times, once there was a 1% chance of a snow day, literally almost everyone in the state closed. I mean, then that means they just choose a random number and go with it. Im sorry but this was a disappointing app for me. The app works all fine and dandy, but it’s not optimized to the iPhone X, XS, XS Max, or XR. Look, I get this app is getting a ton of downloads from people especially since it’s the middle of winter, but with 99 cents per purchase PLUS text message plans, I think you have enough money to quickly optimize it. Very disappointed. I paid for the text updates which was a big mistake. I gave two stars due to accuracy and the fact I paid for text updates and have received none. Furthermore I emailed the app designer and received no response.